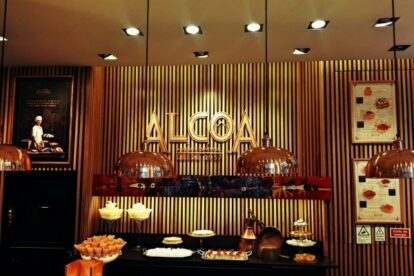 Alcôa, Alcobaça’s renowned convent pastry, can now also be found in Lisbon. With its award-winning cream pastries (known as pastel de nata), a cornucopia filled with egg candy cream, yolks, or bundles of eggs – you will not be able to eat just one thing. I dare say that if you want to get to know the typical Portuguese pastries, starting with these ones is going to be an excellent bet – you probably won’t be able to forget the velvety texture of the egg candy cream. The secret of the success of this pastry about to celebrate its 60th year is the artisanal confection of sweets, birthday cakes and desserts. The first time I had these sweets was in Alcobaça where I went on purpose to taste them. It’s almost impossible to go to Chiado and miss these temptations be enjoyed at the hotel or on a stroll through the streets. If I were you I’d buy (at least) one of the appetizing cornucopias filled with egg candy cream that you can see by the showcase of the pastry shop, and drink an espresso. As a final note, you should know that the Alcôa pastry shop dates back to 1957 when it opened in the city of Alcobaça. It’s now considered a master confectioner of the so-called “monastic pastries,” which follow the recipes of Cistercian monks.